So this thing’s been around for 48 years and this is the first I’ve heard of it? How’d that happen!? I’m sure most of you remember Ford’s Ranchero (the original American Ute) and Chevy’s El Camino. I guess it should come as no surprise that GM was looking to cash in on the craze with a little badge engineering — sell another version (hopefully more upscale — a.k.a. expensive) than the original. So the Pontiac Division worked up this prototype based on its LeMans. It probably wasn’t as much work as you might think, as back in the day you could easily swap entire front clips of cars in different divisions (Chevelle, Tempest, Skylark, F-85) and end up with a “one-of-a-kind” custom. Add in some spiffy interior appointments like the dashboard and seats, and there you go! According to the story on Hemmings Motor News’ web page, this LeMans Safari Sports Truck concept was built for the approval of Pontiac’s president, approval which apparently never came. 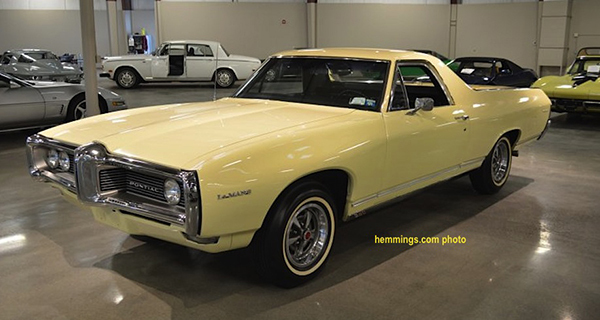 An El Camino clone was instead awarded to GM’s GMC truck division, where it was sold as the GMC Sprint. This was a much cheaper alternative, as the Sprint (and later the Caballero) were not much more than El Caminos with different nameplates. Seems to me that Pontiac would have sold a lot more Safari Sport Utility trucks than GMC sold Sprints. That’s just my opinion of course, but at least the Pontiac would have offered something more distinctive than a different name badge. Get out your checkbook and prepare to write one for $49,000 (yes, it’s for sale) after checking out the Hemmings ad here. The post FROM THE “THEY SHOULDDA BUILT IT” FILES — 1968 PONTIAC SPORT TRUCK appeared first on Buffalo Cars.